When researchers in Alexandria, Egypt unearthed a massive, black sarcophagus last week, the world took a collective gasp and wondered if its contents would unleash an apocalyptic curse capable of rescuing us from the unceasing deluge of badness that is 2018. Buried in the Earth for 2,500 years, the big, fossilized coffin was later pried open, revealing not a dark and powerful omen, but the remains of three decomposed mummies that had been stewing in rusty sewage for two millennia. With the unfortunate absence of a world-ending curse, the mummy marinade has become a focal point in the story. Egypt's Ministry of Antiquities noted that the red-hued liquid was so foul smelling, researchers had to leave the site and steel their nerves before getting back to work. Now, though, online weirdos are calling for the nasty drek -- which is believed to be sewage that seeped through a crack in the coffin -- to be turned into a "carbonated energy drink" in a change.org petition that is fast accruing signatories and giggles across the internet. "We need to drink the red liquid from the cursed dark sarcophagus in the form of some sort of carbonated energy drink so we can assume its powers and finally die," the petition's preamble states. The petition has drawn over 7,000 signatures since hitting the web on Thursday, drawing in folks who'd like to slurp the mummy juice and perhaps contract an ancient form of sepsis. It has a very simple aim that archaeologists cannot condone: "let people drink the red liquid from the dark sarcophagus." The sarcophagus was the largest of its kind ever found in the region, weighing 30-tons. Upon its discovery, speculation was riding high that it could have been Alexander The Great's final resting place, but that was way too optimistic. Instead, there were three skeletons that authorities believe were buried together in a family burial, and the withered remains are currently being examined at the National Museum of Alexandria. Mostafa Waziri, secretary-general of the Supreme Council of Antiquities contradicted many of the gripes people had upon learning there would be no world-ending curse: "We've opened it and, thank god, the world has not fallen into darkness," he told Egypt Today. "I was the first to put my whole head inside the sarcophagus... and here I stand before you." 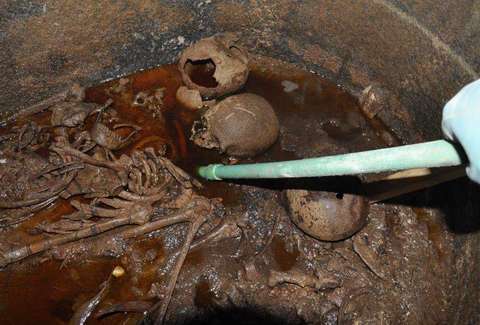 Now, the only thing for authorities left to do is allow people drink of the crypt and see what happens upon imbibing the ancient mummy juice.